For the steamship, see SS Jan Steen. Jan Havickszoon Steen (c. 1626 – buried 3 February 1679) was a Dutch genre painter of the 17th century (also known as the Dutch Golden Age). His works are known for their psychological insight, sense of humour and abundance of colour. Steen was born in Leiden, a town in Southern Holland, where his well-to-do, Catholic family were brewers who ran the tavern The Red Halbert for two generations. Steen's father even leased him a brewery of his own in Delft from the years 1654 until 1657. He was the eldest of eight or more children. Like his even more famous contemporary Rembrandt van Rijn, Jan Steen attended the Latin school and became a student in Leiden. He received his painterly education from Nicolaes Knupfer (1603–1660), a German painter of historical and figurative scenes in Utrecht. Influences of Knupfer can be found in Steen's use of composition and colour. Other sources of inspiration were Adriaen van Ostade and Isaac van Ostade, painters of rural scenes, who lived in Haarlem. Whether Steen actually studied with Ostade is not known. In 1648 Jan Steen and Gabriël Metsu founded the painters' Guild of Saint Luke at Leiden. Soon after he became an assistant to the renowned landscape painter Jan van Goyen (1596–1656), and moved into his house on the Bierkade in The Hague. On Oct 3, 1649 he married van Goyen's daughter Margriet, with whom he would have eight children. Steen worked with his father-in-law until 1654, when he moved to Delft, where he ran the brewery De Slang ("The Snake") for three years without much success. After the explosion in Delft in 1654 the art market was depressed, but Steen painted A Burgomaster of Delft and his daughter. It does not seem to be clear if this painting should be called a portrait or a genre work. Steen lived in Warmond, just north of Leiden, from 1656 till 1660 and in Haarlem from 1660 till 1670 and in both periods he was especially productive. In 1670, after the death of his wife in 1669 and his father in 1670, Steen moved back to Leiden, where he stayed the rest of his life. When the art market collapsed in 1672, called the Year of Disaster, Steen opened a tavern. In April 1673 he married Maria van Egmont, who gave him another child. In 1674 he became president of the Saint Lucas Guild. Frans van Mieris (1635- 1681) became one of his drinking companions. He died in Leiden in 1679 and was interred in a family grave in the Pieterskerk. Daily life was Jan Steen's main pictorial theme. Many of the genre scenes he portrayed, as in The Feast of Saint Nicholas, are lively to the point of chaos and lustfulness, even so much that "a Jan Steen household", meaning a messy scene, became a Dutch proverb (een huishouden van Jan Steen). Subtle hints in his paintings seem to suggest that Steen meant to warn the viewer rather than invite him to copy this behaviour. Many of Steen's paintings bear references to old Dutch proverbs or literature. He often used members of his family as models, and painted quite a few self-portraits in which he showed no tendency of vanity. Steen did not shy from other themes: he painted historical, mythological and religious scenes, portraits, still lifes and natural scenes. His portraits of children are famous. He is also well known for his mastery of light and attention to detail, most notably in Persian rugs and other textiles. Steen was prolific, producing about 800 paintings, of which roughly 350 survive. His work was valued much by contemporaries and as a result he was reasonably well paid for his work. He did not have many students—only Richard Brakenburgh is recorded—but his work proved a source of inspiration for many painters. In 1945, Sturla Gudlaugsson, a specialist in Dutch seventeenth-century painting and iconography and Director of the Netherlands Institute for Art History and the Mauritshuis in The Hague, wrote The Comedians in the work of Jan Steen and his Contemporaries, which revealed that a major influence on Jan Steen's work was the guild of the Rhetoricians or Rederijkers and their theatrical endeavors. It is often suggested that Jan Steen's paintings are a realistic portrayal of Dutch 17th-century life. However, not everything he did was a purely realistic representation of his day-to-day environment. Many of his scenes contain idyllic and bucolic fantasies and a declamatory emphasis redolent of theater. 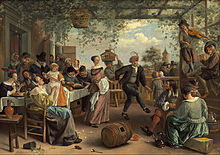 Jan Steen's connection to theater is easily verifiable through his connection to the Rederijkers. There are two kinds of evidence for this connection. First, Jan Steen Steen's uncle belonged to the Rhetoricians in Leiden, where Steen was born and lived a substantial part of his life. Second, Jan Steen portrayed many scenes from the lives of the Rederijkers, an example being the painting Rhetoricians at a Window of 1662–66. The piece is currently held in the Philadelphia Museum of Art which was established in February 1876. The humanity, humour and optimism of the figures suggest that Jan Steen knew these men well, and wanted to portray them positively. With his lavish and moralising style, it is logical that Steen would employ the stratagems from theater for his purposes. There is conclusive evidence that the characters in Steen's paintings are predominantly theatrical characters and not ones from reality. Steen's numerous paintings of a theme most commonly entitled The Doctor’s Visit, such as the composition of 1665–70 in the Rijksmuseum, illustrate his theatrical approach. The story is simple: a doctor attending a young maiden discovers that she is not ill but is in fact pregnant with child. The doctor is a comical character who wears a biretta, a doublet and a small pleated ruff. In fact, he is dressed in the fashion of 1570, not 1670. In contrast, the girl wears what would be the height of fashion at the time of the painting, a Japanese-styled loose kimono robe. This anachronism can be explained only one way: this is not a real doctor but an actor wearing a traditional theater costume. According to Gudlaugsson, “never would so unusual and so completely uncontemporary a costume occur as that of the doctors in [Steen's] work”. 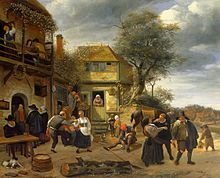 ^ "Jan Steen painter". global.britannica.com. Retrieved October 16, 2014. ^ a b This article incorporates text from a publication now in the public domain: Chisholm, Hugh, ed. (1911). "Steen, Jan Havicksz" . Encyclopædia Britannica (11th ed.). Cambridge University Press. ^ Liedtke, W. A., Plomp, M., Rüger, A., Metropolitan Museum of Art (New York, N.Y.), & National Gallery (Great Britain). (2001). Vermeer and the Delft school. New York: Metropolitan Museum of Art. p. 202. ISBN 0870999737. ^ Liedtke, W. A., Plomp, M., Rüger, A., Metropolitan Museum of Art (New York, N.Y.), & National Gallery (Great Britain). (2001). Vermeer and the Delft school. New York: Metropolitan Museum of Art. p. 343. ISBN 0870999737. ^ Liedtke, W. (2007). Dutch Paintings in the Metropolitan Museum of Art, p. 836. ^ Gudlaugsson, S. (1945). The Comedians in the work of Jan Steen and his Contemporaries, p.8. ^ Gudlaugsson, S. (1945). The Comedians in the work of Jan Steen and his Contemporaries, p.14. Wikimedia Commons has media related to Jan Steen. An overview of Jan Steen's life, and an analysis of The Feast of Saint Nicholas. This page was last edited on 27 February 2019, at 03:31 (UTC).